Posted May 29, 2014, 11:18 p.m. This month I decided to take part in Lowrez Jam, a challenge to make a game using only 32x32 pixels. Extreme art constraints can be exciting, and this one immediately got me thinking about how to set up a grid of sprites. I originally planned to make a 6x6 grid with 6x6 px sprites, but then realized that I can't do math. I had been wanting to try making a turn-based strategy game on a really small grid, but procrastination got the better of me. What I ended up with instead is a crappy version of Triple Town. I've been trying to move away from making platformers for game jams recently in order to broaden my horizons a bit. I was pretty happy with last month's top-down shooter (Strider Submerge), and so this month went with replicating a tile-based puzzle game. The first challenge was getting the screen resolution to work - the smallest resolution I was able to get Stencyl to work in was 40x40px. After trying a few things, I ended up cheating and putting a frame on the side and bottom of the game. The play space is technically 32x32, so hopefully you can ignore the inky blackness that takes up 8 pixels on two of the edges. After taking a number of programming shortcuts, it became difficult to backtrack and try to put in two hierarchies of pieces like in Triple Town. Since I was having the player move around as a farmer in a garden, it was tricky trying to figure out how to tell the player which piece they would lay next. In the end I just gave the player all grass all the time. The only thing you're trying to upgrade and put together is more grass. Also, since there's no turn limit on my game, the player can place as many tiles as they want with full confidence. The only thing different that I tried to add was an irrigation component. The board has a couple of pools on it that will instantly upgrade any plant that comes into contact with it. The player can spread the water out from one of the sources and potentially cover the entire board. 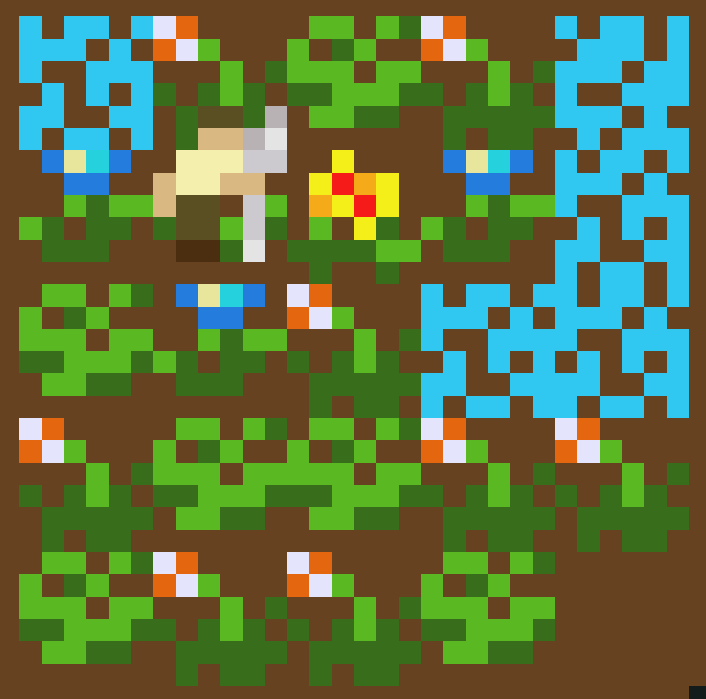 It becomes a little tricky trying to line up your sets of flowers when you have to take into account that some of them will start at a different upgrade level since they have to be near a pond. Since points are based on how high of a level you can get your flowers, the trade-off is between how many plants you want to upgrade easily versus how much land you're willing to give up. Like most of my games so far, it simply gives you a score and resets when you can't carry on any longer.